Sun, sand and adventure on the shores of Case Inlet. Camp Gallagher is a co-ed overnight summer camp for teens on the Puget Sound in Lakebay, Washington. There's no better place to embrace a Pacific Northwest summer. Set sail to a hidden lunch spot, watch the sun melt behind the Olympics, gather round the campfire under a blanket of stars and, most importantly, build friendships that last a lifetime. Already registered for Summer 2019? Visit your ACTIVE account profile to upload your pre-camp forms and pay your balance. 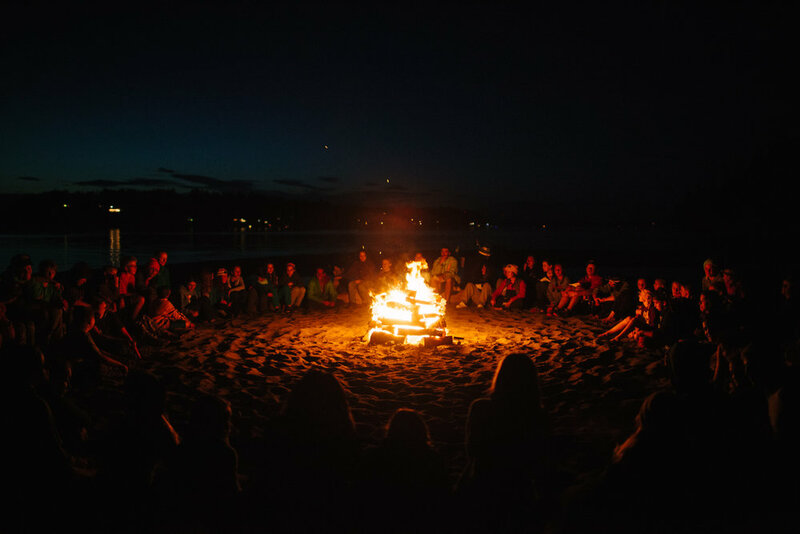 Discover what makes Camp Gallagher the best summer camp for teens in the Pacific Northwest. Find out more about our camping programs, including summer camp for middle schoolers and high schoolers. Book a session at sunny Camp Gallagher. Summer sessions fill up quickly, so don't wait too long! Gallagher staffer Katherine Charters shares her expert insight into that most beloved of camp traditions: the lemming run! She’s a die-hard lemming runner and thinks you should be too. Find out why. We asked our Instagram followers for suggestions of items to pack that are NOT currently on the official packing list. They delivered. Check out the list and decide for yourself whether these items deserve to make the cut. Overnights are one of the longest-standing traditions at Camp Gallagher, and they're a big part of what sets us apart from other summer camps in the region. Find out what they're all about! Camp Gallagher relies on the financial support of its amazing community. Please consider making a tax deductible one-time or recurring donation so that we can continue to create summer magic for many years to come. Thank you!